Consider three leading indicators. First, Mr. Trump has appointed regulatory chiefs who are exceptionally well-qualified and are determined reformers. . . Second, the Trump administration is turning back from unilateral lawmaking. Mr. Obama made several aggressive excursions into this dangerous territory. . . Each was justified by legal arguments that administration officials conceded to be novel and that many impartial experts (including those who favored the policies on the merits) regarded as risible. Each ran into strong resistance from the courts. A third indicator is the introduction of regulatory budgeting, which sounds tedious but is potentially revolutionary. . . Many readers may be puzzled that our tempestuous president should preside over the principled, calibrated regulatory reform described here. I have a hypothesis. Perhaps our first businessman-president, whatever his troubles in dealing with Congress, foreign leaders and other outside forces, is comfortable and proficient in managing his own enterprise, which is now the executive branch. He devoted unusual personal attention to his regulatory appointments, including those whose programs did not figure in his campaign strategy. He gives his subordinates wide running room, checks in with questions and pep talks, and likes management systems and metrics. He may even understand that modern presidents have become too powerful for their own good and can benefit from sharing responsibility with Congress. Chris is a flinty realist when it comes to the ways of Washington, so for him to offer such a bullish reading of what is happening in the Trump Administration is worth taking note of. As I say above, worth buying a copy to read the whole thing. Footnote: In my Los Angeles Times piece earlier this month, I wrote that “It is inconceivable that any of the other leading Republican candidates from the 2016 cycle would have governed as boldly as Trump has.” I had in mind things such as repudiating the Paris Climate Accord, and the EPA’s move to end the corrupt “sue-and-settle” lawsuit racket, which should have been done in the last Republican administration led by someone named Bush. 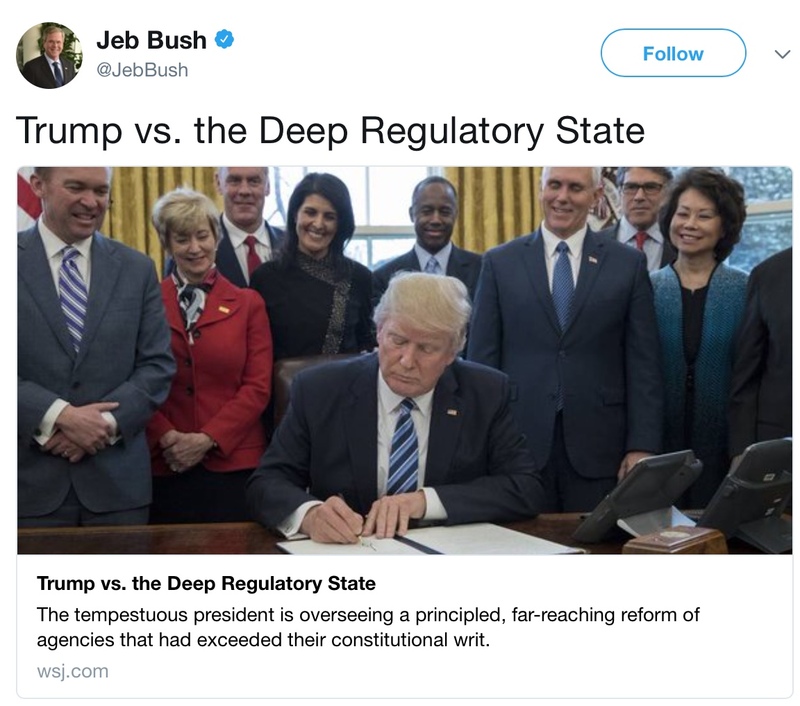 Anyone think a President Jeb Bush would be conducting his administration the way Trump is?